"This is a collaberation with me and Brian from The mighty "Tears of Joy" Hot Sauce in Austin Texas. I've been wanting to work with him for years as I've always been a big fan of his store and the sauces he makes, THE SWORD's "Tears Of Fire", His Tequila Lime Sauce, RED FANG's "Night Destroyer", to name a few. 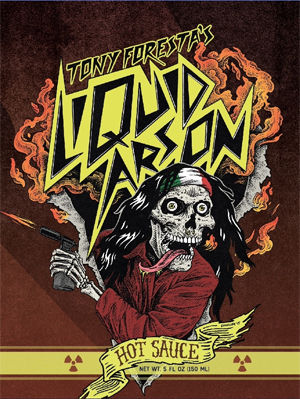 Liquid Arson is an Italian flavored sauce that packs a punch but still has a lot of flavor. Good with almost anything to me personally I think it goes best with meatball subs, pizza or chicken parm. It's kind of like a nuclear marinara sauce." IRON REAGAN recently completed a North American tour with VOIVOD, NAPALM DEATH and label-mates EXHUMED and RINGWORM and will be announcing many additional dates soon. The band recently announced a headlining tour of Australia along with numerous European festival dates. A complete list of dates is included below. IRON REAGAN released their sophomore full-length The Tyranny Of Will via Relapse Records last year along with the viral video directed by Whitey McConnaughy (RED FANG, ZZ TOP) for the song "Miserable Failure".